This guy has some true tribe leadership, doesn't he? I recently stumbled upon will.i.am's first video that he released on YouTube entitled Yes We Can. Following Obama's win, will.i.am produced another song and video entitled It's a New Day, which debuted on Oprah last week. Perhaps I haven't paid attention in the past, but I don't remember this level of support and endorsement for any Presidents in the past. 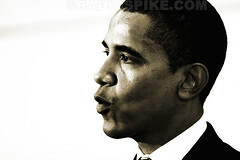 Sure, celebrities have always picked sides, but I don't recall the amount of passion that Obama seems to receive. Maybe it's because it has never been easier for videos like the ones produced by will.i.am to be distributed and become viral. Maybe it's because Obama embraced social tools to reach his tribe. Maybe it's because the soon-to-be-previous administration left a vacuum that needed a particular kind of leader. Maybe. But consider this: powerful people say things like "Obama inspires me to be a better person." Wow, really? Or more personally, my dad, the last person that I would expect to do so, paid his own way -- airplane ticket, lodging, food, laptop, cellphone, opportunity cost of not working -- to spend almost a week in Pennsylvania supporting the campaign. (I would love to share some of his stories, but they are not mine to tell, so I'll see if he wants to write a guest post or 2). It seems like there is something more fundamental going on here, doesn't it? Like maybe what is expected in a President has fundamentally changed. Maybe the tribe that is America desires something new in the leadership that is the President.